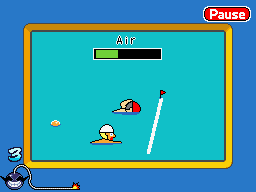 Get Some Air is one of Jimmy T.'s microgames in WarioWare: D.I.Y. The game is based on the sport of competitive swimming. The point of the game is to make the boy in the red swimming cap win the race while managing oxygen intake. There is a meter above the boy's head that slowly goes down from green to red. When the meter reaches red, it starts to beep a little, indicating that the swimmer has to breathe. Tapping the screen makes the boy raise his head from the water and take a quick breath. The opponent also has to take breathers, so this can be used to the player's advantage. If the boy passes the line before the opponent, the player wins. However, if the opponent passes before the player or if the player's swimmer drowns, the game ends in a loss.